هذا المقال هو عن عاصمة يوان التي تطورت لاحقاً لتصبح بكين الحالية. للاستخدامات الأخرى لأسمائها، انظر كانبالو (توضيح) و دادو (توضيح). "تا-تو" تحوّل إلى هنا. لمطالعة الاستخدامات الأخرى، انظر تاتو (توضيح). خان‌باليق Khanbaliq أو دادو Dadu كانت عاصمة أسرة يوان، المركز الرئيسي للامبراطورية المنغولية أسسها قوبلاي خان وتقع في ما هو اليوم بكين، عاصمة الصين الحالية. It was located at the center of modern Beijing. The Secretariat (Zhongshu Sheng) directly administered the Central Region (腹裏) of the Yuan Empire (comprising present-day Beijing, Hebei, شان‌دونگ, شان‌شي، وأجزاء من هـِنان ومنغوليا الداخلية) and dictated policies for the other provinces. Kublai and his successors also claimed supremacy over كامل الامبراطورية المنغولية، although in practice that had already fragmented إلى عدد من الخانيات منذ وفاة مونگكه خان. The construction of the walls of the city began in the same year, while the main imperial palace (大内) was built from 1274 onwards. The design of Khanbaliq followed several rules laid down in the Confucian classic The Rites of Zhou, including "9 vertical and horizontal axes", "palaces in front, markets in back", "ancestral worship to the left, divine worship to the right". [مطلوب توضيح] It was broad in scale, strict in planning and execution, and complete in equipment. The Hongwu Emperor was succeeded by his young grandson the Jianwen Emperor. His attempts to rein in the fiefs of his powerful uncles provoked the Jingnan Rebellion and, ultimately, his usurpation by his uncle, the Prince of Yan. Yan's powerbase lay in Shuntian and he quickly resolved to move his capital north from Yingtian (Nanjing) to the ruins at Beiping. He shortened the northern boundaries of the Mongol city and added a new and separately-walled southern district. 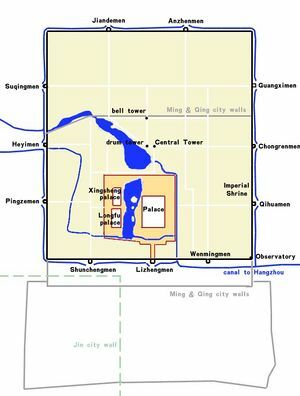 Upon the southern extension of the Taiye Lake (the present Nanhai), the raising of Wansui Hill over Mongol ruins, and the completion of the Forbidden City to its south, he declared the city his northern capital Beijing. With one brief interruption, it has borne the name ever since. Ruins of the Yuan-era walls of Khanbaliq are still extant and are known as the Tucheng (土城), lit. "Dirt Wall"). 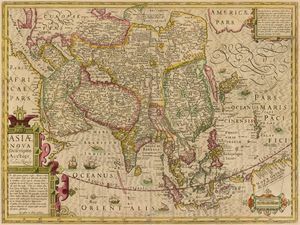 Khanbaliq remained the standard name for the Beijing in Persian and the Turkic languages of Central Asia and the Middle East for quite a long time. It was, for instance, the name used in both the Persian and Turkic versions of Ghiyāth al-dīn Naqqāsh's account of the 1419-1422 mission of Shah Rukh's envoys to the Ming capital. The account remained one of the most detailed and widely-read accounts of China in these languages for centuries. ^ Naquin, Susan. Peking: Temples and City Life, 1400-1900, p. xxxiii. ^ "Beijing This Month - Walk the Ancient Dadu City Wall". ^ أ ب Amitai-Preiss, Reuven & al. The Mongol Empire & Its Legacy, p. 277. ^ Trigault, Nicolas. De Christiana expeditione apud Sinas (Latin). Translated by Louis J. Gallagher as China in the Sixteenth Century: The Journals of Mathew Ricci: 1583–1610, Book IV, Chap. 3 "Failure at Pekin", pp. 312 ff. Random House (New York), 1953.